Paros is one of the Cyclades' larger islands. Its main drawcards are good sandy beaches, traditional fishing villages, and a vibrant nightlife. Windsurfing, kite surfing and scuba diving are popular watersports on the island. Parikia is Paros Island's main port. Many generations have admired its ruined Venetian castle and an impressive Byzantine church. Visitors will also find a few lively jazz clubs. Beach lovers should head to Naoussa on the north coast, where they can enjoy the island's best beaches. Clubbers will find the resort town's nightlife around the waterfront. Lefkes is in the centre of the island, and has a number of tavernas along its pretty winding streets. Antiparos is a separate island. The area has an interesting chapel cavern and more lovely beaches. Island hoppers can use Paros' many ferry connections to explore famous islands and attractions nearby. During the Classical Age, Paros was famous for the white marble quarried within its borders. Today, visitors may well find some beautiful marble work on the island. Other popular souvenirs include shells, leather work, embroidery, and wooden sculptures. Parikia is the best place for shopping on the island. Visitors will find the usual tourist shops and grocery stores, as well as lovely art in the town's galleries. While Paros has a good variety of places to eat out, the best establishments are traditional. Seafood is often the best choice. Visitors can easily find a place to smash plates with locals if the mood takes them. Paros' nightlife buzzes during the summer season. Visitors will find numerous bars and clubs, as well as traditional Greek music and dancing. Naoussa village and Santa Maria Beach are particularly well-loved for their party scenes. That said, Paros is essentially a relaxed island, where the nightlife can't compare to destinations like Mykonos. Paros' winding cobbled streets and whitewashed buildings give visitors a taste of the old world. That said, the island is most famous for its beaches, which range from remote and quiet to extremely crowded party hubs. Generally speaking, conditions are good for windsurfing. 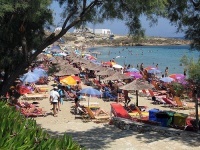 Paros can get very crowded, which may not suit those seeking peace and relaxation.